Peter Svidler has had a stellar last couple of months, winning the Russian Championship, the World Cup and now the European Club Championship. He recently gave an interview where he talked about his World Cup victory, and also what he isn’t willing to do to become World Champion. The first emotions after your victory have no doubt already passed? What “aftertaste” has Khanty-Mansiysk left? It’s left what for me is an extremely rare level of satisfaction – both with my play and my result. And monstrous fatigue. And what about the city itself? In general, which cities do you like to spend time in and play in? Before the tournament did you have the feeling that you could win the Cup? Were you inspired by your Superfinal success? Until my win against Kamsky I didn’t have that feeling, but after the second game of that match – yes, it began to seem as though something good might come of it. The Superfinal was more of a bad sign. If you think about it logically then who ever heard of managing to play so well in two tournaments in a row? Grischuk said that after his wins in the third and sixth rounds he had such euphoria that in the first games of the next rounds his play was too relaxed. How did you manage to handle your emotions? Well, to be frank, after my match against Gata Kamsky I also played less than brilliantly. 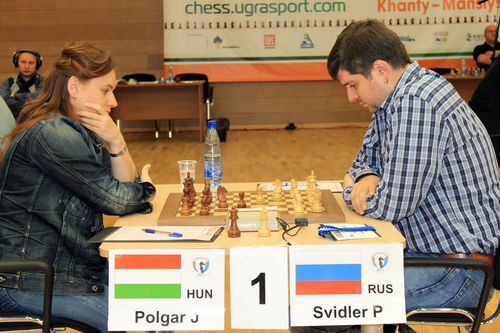 It was the same after the win against Judit Polgar. It’s possible, however, that’s connected more to the complete collapse of my opening repertoire as White. 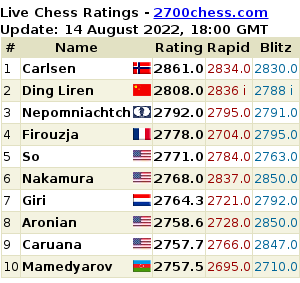 Overall, however, I can see Grischuk’s point. Is it psychologically easier or more difficult to play against a woman? Did Judit Polgar press too hard in the second game of your match? It’s hard to play against that particular woman, but not because she’s a woman but simply because she plays very well. Again, the memory of previous wounds makes itself known, although of late both my score and play against Judit have improved a bit. There’s no longer the previous sense of doom. Yes, in the second game she could have repeated moves and drawn, but it seems she didn’t want to let her chance slip. Judging by what she said at the press conference Judit thought she was better all the time. Plus, there wasn’t yet any great risk at that point. Was the match against Ponomariov also a kind of revenge? Yes, it was one revenge after another at the World Cup. It started in the third round, against Caruana. Before the match with Kamsky I somehow told myself that it’s a good sign that there was a whole series of people against whom I’d had difficulty my whole life. Old scores do, after all, have a certain influence. We always sense that internal dynamic, imagining how our opponent rates his chances against us: that all plays a role. Not a decisive one, but a role. From the outside it seems as though in contrast, let’s say, to Ningbo, you played very confidently in Khanty-Mansiysk, although in terms of their level of play your opponents were stronger. Perhaps a factor was that you didn’t have the burden of team responsibility? That’s no surprise at all, as in general I play better against top players, at least when I’m in normal form. And yes, I’ve got myself very wound up in recent team events. It’s more comfortable to play for yourself. In the first two rounds you needed tiebreaks, but you managed to win all the other matches without them. Did you manage to warm up? Everything went very well, including that. In a certain sense I was lucky with the colours: starting with lifeless draws as White you give your opponent a great temptation to try and end everything before tiebreaks. As a result I managed to get a lot of real play as Black. No, of course not! But from some point on I already had the feeling that another draw with White in 15 moves was no tragedy. You said at one of the press conferences that happiness is a fleeting emotion – wins bring joy only for a very short time while losses take a long time to be wiped from your memory. Does chess bring more joy or suffering? Well, if not happiness then at least satisfaction remains. I’m still totally pleased with myself, and I’ll continue to be for a while longer. Chess brings me great joy or otherwise it would be extremely difficult. And I still get great pleasure from the process. In one of your interviews it seems you said that fighting for the crown wasn’t your main aim at the current moment. After qualifying for the Candidates Matches have your priorities changed? I can’t even remember saying something like that, but in any case, fighting for the crown is now very important for me. I don’t know what will come of it but I’m planning to approach things very seriously, and to prepare in the correct manner. What does preparing seriously mean? Giving up TV series, hiring new seconds, buying a super computer…? Getting myself more into order, holding training sessions. A new computer – that’s possible. As for seconds, that’s something I’ll have to think about as it’s not straightforward. It’s a long time since I’ve had constant helpers. What is there that you’re not prepared to sacrifice for that higher goal? My attitude to life, no doubt. I’ve got a calm and good-natured attitude to the world, and I’m not prepared to become someone else. They say that all the champions were ruthlessly bloodthirsty. So how can you compete? They say that, yes. I’d don’t know how much truth there is in it. And partly because people say that Tal has always been a hero for me. And among non-chess players, who’s your idol? Perhaps a fictional character from books or films? Off the top of my hat not a single name comes to mind. I can describe the general features of my favourite literary heroes – intelligence, a sense of humour, self-irony. You’ve won two outstanding tournaments in a row. If you’re offered would you agree to lead the Russian team at the European Team Championship? If they offered and none of my teammates were against it then I’d agree. What needs to happen with the team so that later there won’t be the feeling that something was left undone? I’ve got no clear idea about that. Before the World Championship in China everything was done so intelligently. I say that without a hint of irony. Personally I need to be a little more calm and confident. It seems as though things should be a little better with that now, so let’s see. 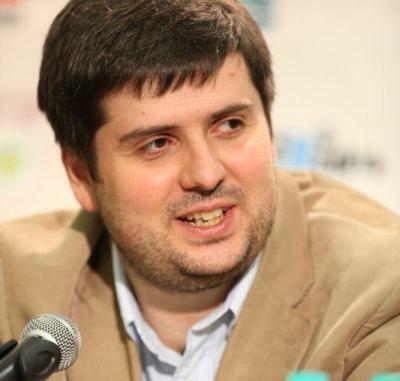 Svidler: "I'm not prepared to become someone else"